The analysis of recorded audio sources has become increasingly important in ethnomusicological research. Such audio material may contain important cues on performance practice, information that is often lost in manually generated symbolic music transcriptions. In collaboration with Frank Scherbaum (Universität Potsdam, Germany), we considered a musically relevant audio collection that consists of more than 100 three-voice polyphonic Georgian chants. These songs were performed by Artem Erkomaishvili (1887–1967)—one of the last representative of the master chanters of Georgian music—in a three-stage recording process. This website provides the segment annotations as well as the F0 annotations for each of the songs in a simple CSV format. Furthermore, visualizations and sonifications of the F0 trajectories are provided. The TSM toolbox has been developed by Jonathan Driedger and Meinard Müller. It contains MATLAB implementations of various classical time-scale modification (TSM) algorithms like OLA, WSOLA, and the phase vocoder. Furthermore, the toolbox also provides the code for a recently proposed TSM algorithm based on a combination of the classical algorithms as well as harmonic-percussive source separation (HPSS). Finally, it also includes a wrapper function which allows to call the commercial state-of-the-art TSM algorithm élastique by zPlane directly from MATLAB. To show how the algorithms can be applied and to give some demo applications, the toolbox also includes several demo scripts and additional code examples. The MATLAB implementations provided on this website are published under the terms of the General Public License (GPL). The Chroma Toolbox has been developed by Meinard Müller and Sebastian Ewert. It contains MATLAB implementations for extracting various types of novel pitch-based and chroma-based audio features. The MATLAB implementations provided on this website are published under the terms of the General Public License (GPL). A general overview of the chroma toolbox is given in [ME_ISMIR2011]. The Tempogram Toolbox has been developed by Peter Grosche and Meinard Müller. It contains MATLAB implementations for extracting various types of recently proposed tempo and pulse related audio representations, see [GM_IEEE-TASLP2011]. These representations are particularly designed to reveal useful information even for music with weak note onset information and changing tempo. The MATLAB implementations provided on this website are published under the terms of the General Public License (GPL). On this website you find results and audio examples for a score-informed source separation procedure as described in [EM_ICASSP2012]. Based on non-negative matrix factorization (NMF), the main idea used in this approach is to impose score-based constraints on both the template as well as the activation side. Using such double constraints results in musically meaningful decompositions similar to parametric approaches, while being computationally less demanding and easier to implement. On this web page, we supply MIDI-audio synchronization results obtained from the synchronization procedure described in [EMG_ICASSP2009]. Providing these results, our goal is to establish a platform for comparing and discussing various synchronization and alignment procedures. 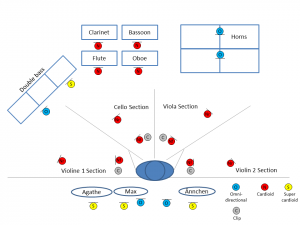 In general terms, music synchronization denotes a procedure which, for a given position in one representation of a piece of music, determines the corresponding position within another representation. Depending upon the respective data formats, one distinguishes between various synchronization tasks. 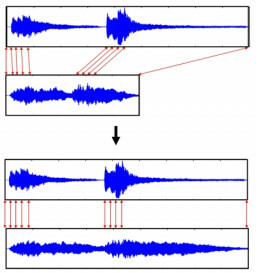 For example, audio-audio synchronization refers to the task of time aligning two different audio recordings of a piece of music. These alignments can be used to jump freely between different interpretations, thus affording efficient and convenient audio browsing. The goal of MIDI-audio synchronization is to coordinate MIDI note events with audio data. The result can be regarded as an automated annotation of the audio recording with available MIDI data. It is the objective of our motion capture database HDM05 to supply free motion capture data for research purposes. HDM05 contains more than three hours of systematically recorded and well-documented motion capture data in the C3D as well as in the ASF/AMC data format. Furthermore, HDM05 contains for more than 70 motion classes in 10 to 50 realizations executed by various actors. The HDM05 database has been designed and set up under the direction of Meinard Müller, Tido Röder, Michael Clausen, Bernhard Eberhardt, Björn Krüger, and Andreas Weber. The motion capturing has been conducted in the year 2005 at the Hochschule der Medien (HDM), Stuttgart, Germany, supervised by Bernhard Eberhardt.